10 Variations on Unser Dummer P (Piano Solo). Composed by Wolfgang Amadeus Mozart (1756-1791). 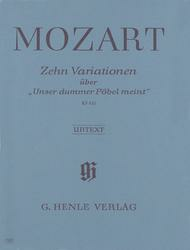 Edited by Ewald Zimmermann. For Piano. Piano (Harpsichord), 2-hands. Henle Music Folios. Pages: 13. SMP Level 10 (Advanced). Softcover. 16 pages. G. Henle #HN189. Published by G. Henle (HL.51480189).About SMP Level 10 (Advanced)Very advanced level, very difficult note reading, frequent time signature changes, virtuosic level technical facility needed.